Home > Shop By Brand > Dodo Juice > Dodo Juice Light Fantastic Soft Wax 30 ml. Show off your light vehicle in the best possible light! Dodo Juice Light Fantastic Soft Wax is a pure carnauba wax that looks brilliant on light colored vehicles, metallics, and pearlescent paints. No artificial colors are added to Light Fantastic so you’re seeing the true color of white carnauba wax in the jar. On your vehicle, Light Fantastic Soft Wax creates a crystal clear, wet-look shine. Dodo Juice Light Fantastic Soft Wax is made with real No. 1 grade powdered white carnauba wax, coconut oil, and pure white beeswax. White carnauba is the purest available and it delivers the clearest, most luminescent finish on light paint colors. This wax has been formulated specifically to yield the best results on light colored vehicles, though it can be used on any color. 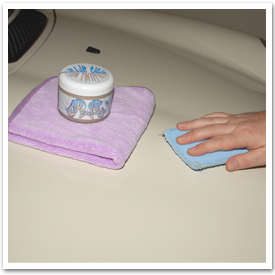 The wax can also be used on exterior trim because it will not leave white wax stains. If you have a white pearl finish or subtle metallic flecks, Dodo Juice Light Fantastic Soft Wax’s blend of waxes shows off the paint in the best light. Fantastic! Just look at the shine on this 2006 Lamborghini Murcielago in Verde Ithaca Mic (pearl metallic blue green), waxed by forum member HighEndDetail. Before we went to Mauritius, pillaging the dodos and eating the natives, it was a pretty unspoilt kind of place. Like the island on Lost before a 747 landed, and The Others got there. And someone installed a hatch. In short, it was a pure, virgin place, that had never been exposed to things like tracker mortgages and processed cheese. Light Fantastic is that kind of a wax. There's no added colour, so what you see is the colour of carnauba, and a bit of coconut oil, because we stuck some of that in, too. It's particularly suitable for light coloured cars, including those painted in light coloured metallic or pearlescent paints. But to be honest, you could slap it on anything. hands, to apply Dodo Juice Light Fantastic Soft Wax. wait 5-10 minutes before buffing. As with any car wax, we’ve found that the best results are obtained on a clean, smooth paint finish. Use a prewax cleaner, like Dodo Juice Lime Prime Pre-Wax Cleanser, to remove old layers of wax and improve the paint’s texture. 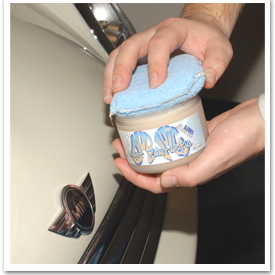 Then apply a layer of Light Fantastic Soft Wax using a soft foam applicator or bare hands. Allow it to cure for 5-10 minutes. Since the cure time is relatively short, we found it easiest to work in sections. Buff off the wax with a soft Cobra Deluxe Jr. 600 Microfiber Towel. Apply another coat after 24 hours if desired. Well, it worked, basically. Put Jetseal 109 sealant on and then this on new white truck. Gave it a kind of a shiny, pearlescent glow, kind of like those Lexus type paint jobs. It was very very easy to apply --it ought to be after two coats of Jetseal. My complaint is the price. This isn't rocket surgery after all. The Jetseal actually has a demanding job to do. This is stuff shiny stuff that sits on top and looks pretty until it rains. I'll try that Pinnacle Signature $50 product before I try this again.